This past weekend, Rachel McAdams confirmed that she has indeed had talks with Marvel Studios about a potential role in Scott Derrickson's upcoming Doctor Strange... but what has remained a mystery has been the exact part for which she has been rumored. One possibility that we threw out was Clea, the niece and close disciple of Dormammu and a romantic interest for Doctor Strange, but now there is some evidence that could suggest that she is instead playing Linda Carter - a character in Marvel Comics who also goes by the moniker Night Nurse. The feature side had plans for her down the road so that was the only time we ran into a conflict. So we just used another name. From this we know that Marvel Studios' movies division is planning to use Linda Carter in an upcoming film - and it's ComingSoon that connects the dots to the character potentially being introduced into the Marvel Cinematic Universe via Doctor Strange. 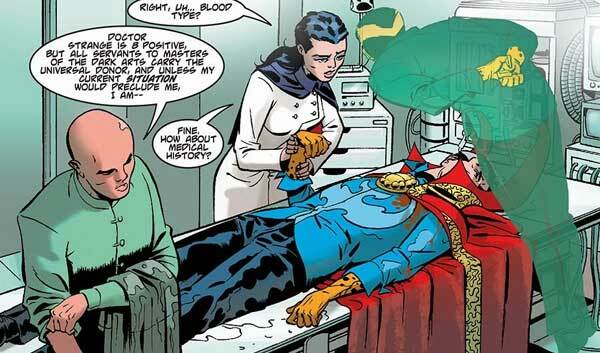 The site notes that Carter was reintroduced to Marvel Comics thanks to Brian Michael Bendis' "Daredevil" run in 2004, but more significantly points out that she played a major role in an acclaimed "Doctor Strange" miniseries released a few years later. In Brian K. Vaughn's "Doctor Strange: The Oath," the Sorcerer Supreme and Carter team up to try and find a cure for cancer so that Strange can heal his dying assistant, Wong. By the end of the run, the two heroes became romantically linked. Adding a bit more tinder to this fire is the fact that Marvel is planning to reprint this miniseries as a giveaway this Halloween. As of now, Rachel McAdams isn't attached to star in Doctor Strange, though the movie is already assembling an incredibly talented lineup - including Benedict Cumberbatch as the titular master of magic, Chiwetel Ejiofor as Baron Mordo, and Tilda Swinton as The Ancient One. Jon Spaihts penned the screenplay, and the plan is to have production begin this fall in London. The blockbuster is set to be the 2016-release cousin of Joe and Anthony Russo's Captain America: Civil War, but we still have quite a while to see it, as it isn't scheduled for theatrical release until November 4, 2016. Do you think it's possible that Rachel McAdams could play Linda Carter in Doctor Strange, or do you have a theory of your own? Feel free to share in the comments below.